311 South Broad Street stood vacant for at least 15 years before being demolished late March into April along with 301-309 to the north (seen on the left) for the slated 47-story Dranoff luxury hotel/condo tower. 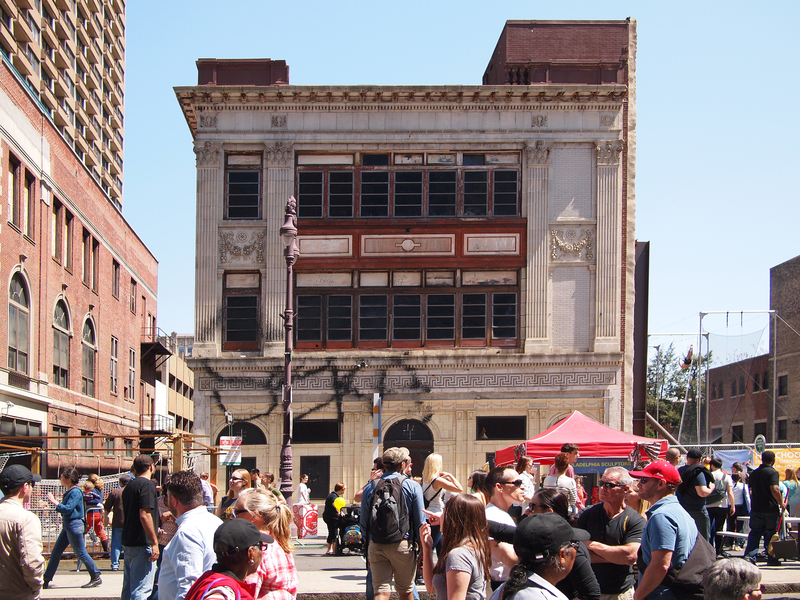 In recent years, the building has been a canvas for the lesser talented graffiti artists of Philadelphia (seen here during the Philadelphia International Festival of the Arts), as well as a backdrop for the summer PHS pop-up garden two years ago. But the alleged history of the building includes the Superior Laboratories under which the building was opened in 1910, a dual residency in the 1930s with a nightclub called “Benny the Bums” on the ground and the WPA Federal Arts Program occupying the upper floors, another fun-named nightclub called the Piccadilly Dine & Dance, and the Regency Ballroom, 27 April 2013. 29 Apr	This entry was published on April 29, 2015 at 7:21 am. It’s filed under Architecture, Center City, Historic Preservation and tagged #thisjawnmatters, Philly Demolition. Bookmark the permalink. Follow any comments here with the RSS feed for this post. Does any one have any photos of the Regency Ball room?